As the name suggests, the sheet is folded exactly once right across the middle for this product. This results in four faces that you can take advantage of to present your ideas. The best use for this version is as a classic informational leaflet. A Z-fold (also known as a zigzag or accordion fold) consists of a series of parallel folds in alternating directions. 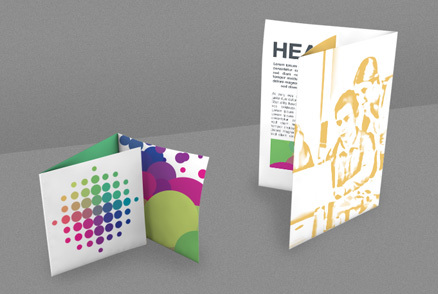 The resulting leaflet can have six, eight or even ten faces as required. This format is especially well-suited for lists. Here the sheet is folded inwards from opposite sides of the sheet. Depending on what you need, there can be two folds (resulting in six panels; this version is also called a tri-fold or letter fold), four (known as a roll fold) for a total of ten faces – or six (called a barrel fold) for 16 faces. 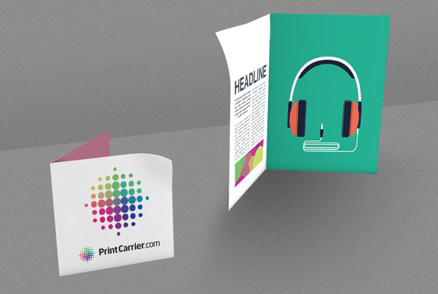 Leaflets folded this way are commonly used for advertising or distributed at trade fairs. Making a double-cross fold (also known as a French fold) involves at least one vertical and one horizontal fold. 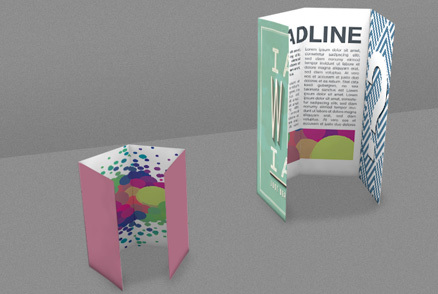 This scheme can also be combined with a Z-fold or a roll/barrel fold to yield bespoke flyers with between eight and 16 panels. This fold can also be opened like a gate, but one of the two leaves then unfolds again. This is an ideal way for you to hide information so it isn’t immediately visible. Use all your creativity to create your own flyers. 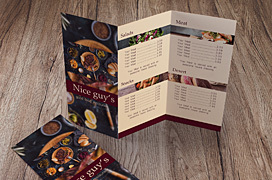 There is always a good reason to print flyers - whether in the form of fact sheets, advertising media and print menus for your restaurants, magazines or table-top displays are all part of the leaflet family. 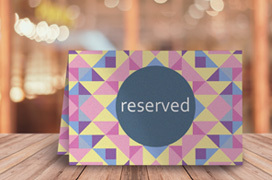 They can be used, for example, as small name or reservation signs. If, however, you are rather , you will also have a lot of choices, with our folded flyers, flyers with embossed shapes and flyers with rounded corners! Nor are all papers the same. They vary in terms of their look, feel and weight. Depending on the occasion, you can choose either matt or glossy paper. 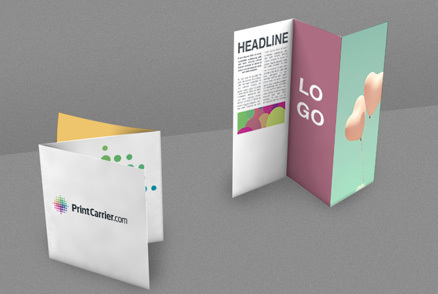 Our folded flyers are available in weights ranging from 70 to 300gsm. 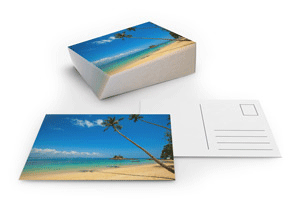 Paper weighing up to 135gsm can be easily folded without scoring first. From 175gsm we strongly advise scoring, however. And with all stocks from 220gsm on up, scoring is automatically included to make sure you can the best possible final result. When folded sheets are intended for heavy and frequent use, like menus, we additional recommend that you have them laminated with plastic foil. This way you can count on them to stay in good shape for a long time to come. 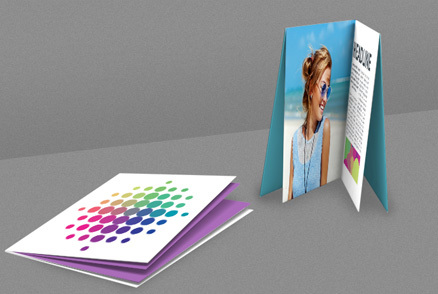 We print your folded leaflets in 4c, in other words full colour, on both sides. 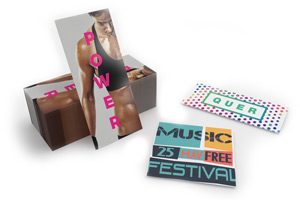 Whether you opt for offset or digital printing, you can always count on receiving the same top-notch results. We take pains to use only first-rate paper and inks, and we do the printing expertly on the best presses money can buy so you’ll be happy with the finished products. 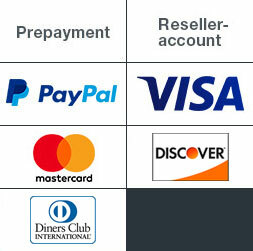 We give our customers – which includes you – a 100% satisfaction guarantee. We want to convince you of the quality of our products and therefore offer first-time clients their money back if they are unhappy for any reason. With repeat customers, we bend over backwards to find a solution to any problem that may arise. Our customer service will be glad to answer your questions. We’re always available to advise and assist you. If you need a quick answer, take advantage of our live chat. Or simply ring us: our customer hotline can be reached from Monday to Friday between 9 a.m. and 5 p.m. on +44 (0) 121 4690093.